How to create RSS feed? "RSS stand for 'Rich Site Summary' is a family of web feed formats for delivering regularly changing web content like blog entries, news headlines, audio, and video in a standardized format. 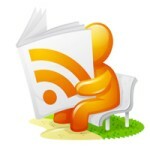 Many news-related sites, blogs and other online publishers syndicate their content as an RSS Feed to whoever wants it. An RSS document includes full or summarized text, plus metadata such as publishing dates and authorship"
In other words we can say, RSS is an improved version of bookmarking a site, where the reader does not need to do things manually as they are expected to do, while maintaining bookmarks, which usually gets messy when you are required to keep a track of a lot of websites in one go. RSS feeds rather get updated about every minute change in the website through a feed-reader which allows one to read updates from a particular site that you have been subscribed to. Easier to maintain a track of your favorite websites and get regular updates from them without the need to manually check each one, on a regular basis. Website owners can easily get to let their subscribers know of any change to the website, once they submit regular feeds to RSS feeds. Rather than searching all over the place, you can get all your favorite information in one place. It’s literally impossible to miss out on important information, once you are subscribed to RSS feeds. It saves a lot of your time and you get the most handy information right on your PC as quickly as a webmaster updates the website. Email need not be shared for you to get updates, so your inbox is free of unnecessary spam and there are no security issues. Now that we have an idea, what a RSS Feed is, let us come to the next part and learn how the RSS Feed actually works. The way a RSS feed or RSS channel works is based on a very simple technology. RSS feeds are XML files which are coded and safely stored on a server. Once these Feeds are created, they are linked to your website where when the users subscribe they get details brought across to them on a regular basis with the help of RSS Aggregators. RSS Aggregators or RSS readers, explained simply are computer programs that collect all the information or feeds in one place and organize them for the subscriber’s easy reading.